You may want to jot down notes or store files related to a specific record. 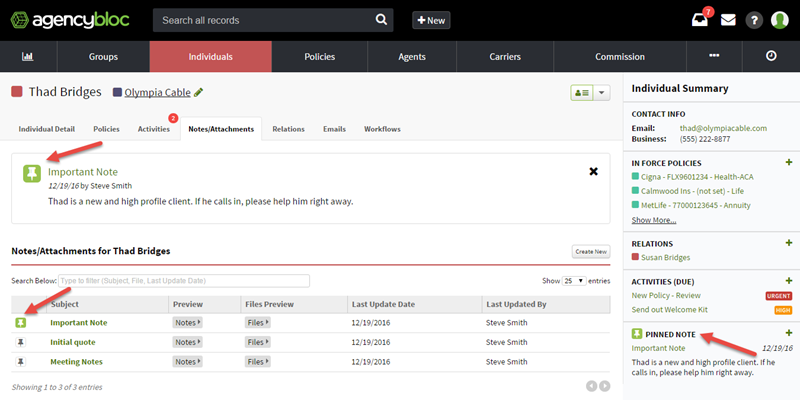 Every group, individual, agent, and policy record has a ‘Notes/Attachments’ tab that you can use to store this data. You can update them over time. When you want to track a client interaction or save a file for auditing/posterity, it's best to use activities. Learn how to use notes, attachments, and pinned notes in this article. To add or update notes, users need Change Notes/Attachments permissions. You can add notes about to a contact or upload files. Use notes & attachments for storing items for easy reference and safekeeping. Once you are viewing a record, select the notes & attachments tab. Enter a subject and then add your notes or attachments. Drag and drop files or select choose files. Now, you can look up notes or the attached files any time you need. To update a note, select the note and follow the steps above make your changes. To remove a file from a note, select the 'x' next to the filename and confirm you'd like to delete the file. If you need to delete the note, select to delete. 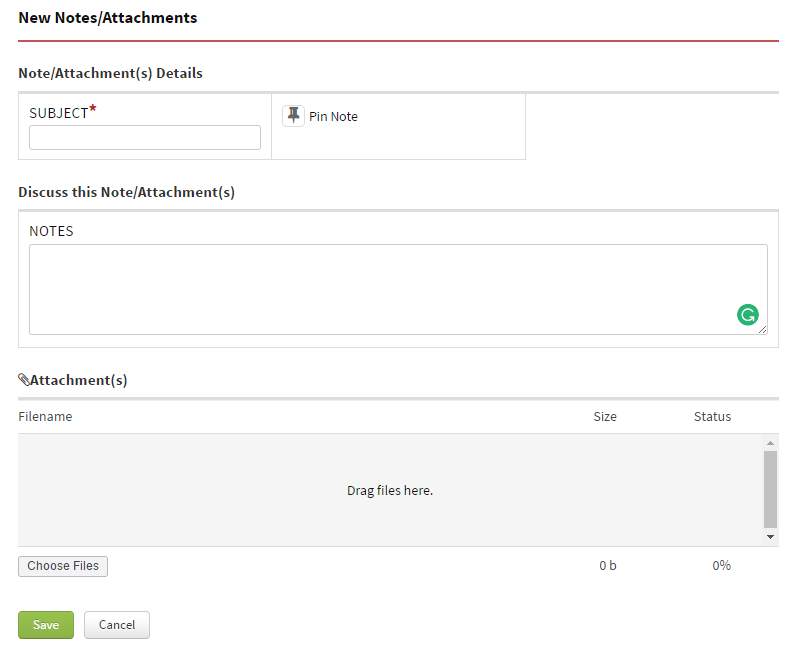 If you delete a note that has attachments connected it, those attachments will also be removed. In a list of notes and attachments, you might have one that is more important or that you want everyone to see. To help with that, you can pin a note. Pinning a note adds it to the top of the notes & attachments page and also includes it in the summary for quick reference. Add important reminders, documents, or information to pinned notes for quick access. To pin a note, click on the push pin icon. You can pin one note and the push pin will be green to let you know which note has been pinned. While there isn't a specific limit on file size or storage, the bigger the files, the longer it will take to upload. So as you add files, it's a good idea to keep an eye on file size. How many notes can I add on a record? Good question, add as many as you need.